Home / Tax Planning / Could Medicare Premiums Lower Your Taxes? Health care is a top concern for many Americans, especially people who are age 65 and older. While these individuals qualify for basic Medicare insurance, they may need to pay additional premiums to get the level of coverage they desire. Those premiums can add up to a substantial annual sum, especially if you're married and both you and your spouse are paying them. But the silver lining is that paying those premiums may help your tax situation. For starters, many people are unclear about Medicare health insurance programs and options. Here's a brief overview. Medicare Part A. This coverage is commonly known as hospital insurance. It covers inpatient hospital care, skilled nursing facility care and some home health care services. Part A is free to people over age 65 who paid Medicare taxes for 40 or more quarters during their working years. They're considered to have already paid their Part A premiums via Medicare taxes on wages and/or self-employment income. People who didn't pay Medicare taxes for enough months while working generally must pay for Part A coverage. The premium amount depends on how many quarters the individual paid taxes into the program. If you paid Medicare taxes for 30 to 39 quarters during your working years, the 2019 Part A premium is $240 per month ($2,880 for the full year). If you paid Medicare taxes for less than 30 quarters, the 2019 Part A premium is $437 per month ($5,244 for the full year). The same Part A premiums apply to a spouse who paid Medicare taxes for less than 40 quarters while working. Medicare Part B. This coverage is commonly called Medicare medical insurance. It mainly covers doctors and outpatient services. Medicare-eligible individuals must pay monthly premiums for this benefit. The premium amount depends on the individual's modified adjusted gross income (MAGI) for two years earlier. For example, your 2019 premiums depend on your 2017 MAGI. This term refers to the adjusted gross income (AGI) amount plus any tax-exempt interest income. To get Part B coverage, you have to pay a base premium, which is $135.60 per month ($1,627 for the full year) for 2019. Plus, higher income individuals must pay a surcharge. Married individuals who filed 2017 joint returns with MAGI in excess of $170,000. Surcharges accrue on a graduated schedule. That is, the more MAGI you earned in 2017, the higher your Part B costs will be for 2019. Including the surcharge (if you owe it), the 2019 Part B monthly premiums for each covered person can be $189.60 ($2,275 for the full year), $270.90 ($3,251 for the full year), $352.20 ($4,226 for the full year), $433.40 ($5,201 for the full year) or $460.50 ($5,526 for the full year). Married individuals who filed 2017 joint returns with MAGI in excess of $750,000. Medicare Part D. This option is for private prescription drug coverage. Base premiums vary depending on the plan you select. Higher-income individuals must pay a surcharge in addition to the base premium. For 2019, the Part D surcharges depend on your 2017 MAGI, and they increase based on the same scale as Part B surcharges. The good news is that the 2019 surcharges are slightly lower than for 2018, except for those in the highest income category. The 2019 monthly Part D surcharge amounts for each covered person can be $12.40, $31.90, $51.40, $70.90 or $77.40. Medigap. Medicare Parts A and B don't cover all health care expenses. Coverage gaps include co-payments, co-insurance and deductibles. So, some people opt to buy a so-called “Medigap” policy. This is private supplemental insurance that's intended to cover some or all gaps. In most states, insurance companies can sell only standardized Medigap policies that offer the same basic benefits. Some policies offer additional benefits for an additional cost. Premiums vary depending on the plan you select. Important note: Before you travel outside the United States, find out whether Medicare will cover you while you're away. Generally, the coverage is limited or nonexistent. If you don't have coverage when traveling overseas, you can purchase supplemental policies to cover medical expenses incurred outside the United States, including evacuations. Medicare Advantage. Federal Medicare benefits may be provided through Part A and Part B coverage or through a so-called “Medicare Advantage plan” offered by a private insurance company. 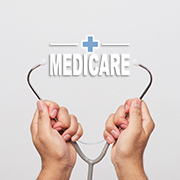 Medicare Advantage plans are sometimes called Medicare Part C.
Medicare pays the insurance company to cover your Medicare Part A and Part B benefits. The Medicare Advantage insurance company then pays your claims. A Medicare Advantage plan may also include prescription drug coverage (Medicare Part D), and it may cover dental and vision care expenses that are not covered by Medicare Part B. Private fee-for-service plans that generally allow you to go to any medical service provider that accepts the plan's payment terms. When you enroll in a Medicare Advantage plan, you continue to pay Medicare Part B premiums to the government. You may need to pay a separate additional monthly premium to the insurance company for the Medicare Advantage plan, but some Medicare Advantage plans don't charge an additional premium. The additional premium, if any, depends on the plan you select. Important note: Medigap policies don't work with Medicare Advantage plans. So, people who join a Medicare Advantage plan should discontinue their Medigap coverage. Premiums for Medicare health insurance can be combined with other qualifying health care expenses for purposes of claiming an itemized deduction for medical expenses on your individual tax return. For 2018, you could deduct medical expenses only if you itemized deductions and only to the extent that total qualifying expenses exceeded 7.5% of AGI. For 2019, the itemized deduction threshold for medical expenses increases to 10% of AGI, unless Congress extends the 7.5% hurdle. The Tax Cuts and Jobs Act nearly doubled the standard deduction amounts for 2018 through 2025. For 2019, the standard deduction amounts are $12,200 for single filers, $24,400 for married joint-filing couples and $18,350 for heads of households. So, fewer individuals will claim itemized deductions. However, having significant medical expenses (including Medicare health insurance premiums) may allow you to itemize and collect some tax savings. Important note: Self-employed people and shareholder-employees of S corporations can generally claim an above-the-line deduction for their health insurance premiums, including Medicare premiums. So, they don't need to itemize to get the tax savings from their premiums. Contact your tax advisor if you have additional questions about Medicare coverage options or claiming medical expense deductions on your personal tax return. Your advisor can help determine the optimal overall tax-planning strategy based on your personal circumstances.